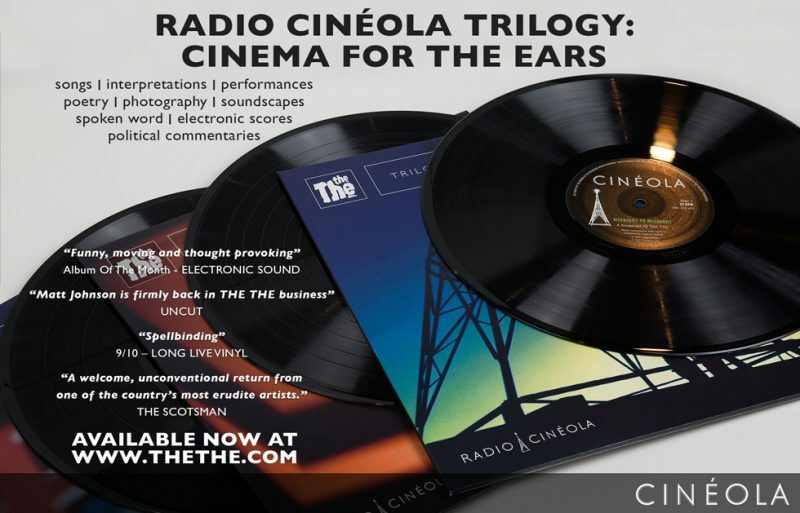 RADIO CINEOLA TRILOGY NEW BOXSET ANNOUNCED! JG Thirlwell, Thomas Leer, Johnny Marr, James Eller, Meja, Anna Domino, Zeke Manyika, Colin Lloyd Tucker, John Tottenham, Thomas Feiner, Elysian Fields, Liz Horsman, Charlotte Etc. Tom Bright, Gillian Glover, Willis, Johanna St Michaels, Jacob Sahlqvist, Kate Wilkins, Gerald Jenkins, William Engdahl, Neil Clark, David Edwards / Media Lens, Marian St Laurent, Lucinda Rogers, Neil Sanders, Abdi Assadi, Zoe, Hepden, Eric Schermerhorn, Megan Drew, Polly Maberly, Niall Greig Fulton and others. Luxury rigid board slipcase with black Wibalin® and silver foiling. Containing 3 x LPs on black heavyweight 180g vinyl, each with their own printed sleeves and antistatic inner bags. 48pp Perfect bound book of lyrics, poetry, exclusive photographs and guest commentaries about the project. Download code included in each album which can be redeemed for 320k MP3 copies of the albums. Luxury rigid board slipcase with black Wibalin® and silver foiling. Including 3 x CD albums each contained within a 68 page hardcover book that features lyrics, poetry, exclusive photographs and guest commentaries about the project.